A fishing sinker or knoch is a weight used in conjunction with a fishing lure or hook to increase its rate of sink, anchoring ability, and/or casting distance. Fishing sinkers may be as small as 1 gram for applications in shallow water, and even smaller for fly fishing applications, or as large as several pounds or considerably more for deep sea fishing. They are formed into nearly innumerable shapes for diverse fishing applications. Environmental concerns surround the usage of lead and other materials in fishing sinkers. A large variety of sinkers exist which are used depending on the fish being pursued, the environment, the current and personal preference. Pyramid sinkers are shaped like a pyramid and are used when it is desirable to anchor on the bottom of water bodies. They are attached to the terminal end of fishing line by loops of brass. Barrel or egg sinkers are rounded and often bead-like with a narrow hole through which fishing line is threaded. These sinkers are desirable on rock or debris covered substrates. Split-shot sinkers are small and round with a split cutting halfway through the sinker. 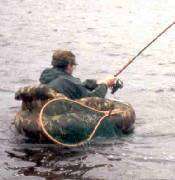 The split can be placed on a piece of fishing line and then crimped closed. This feature makes adding and removing the weights easy and quick. Bullet sinkers are bullet-shaped and used widely in largemouth bass fishing for rigging plastic worms "Texas-style". Dipsey sinkers are ovate or egg-shaped and are attached to the fishing line with a loop of brass wire embedded in the sinker. Bank sinkers are long and ovate and have a small hole at the top for the fishing line to thread through. A claw sinker consists of a sinker weight which is typically of round shape, and a number of metal wire spikes grouped around the sinker weight acting as barbs. Claw sinkers are used in surf fishing on sandy bottoms with strong currents, mainly to prevent the sinker from getting carried off with the current. Upon casting a claw sinker, the line is briefly tugged so that the claws will dig themselves into the sand, allowing the rig to stay in place. An ideal material for a fishing sinker is environmentally acceptable, cheap and dense. Density is desirable as weights must be as small as possible, in order to minimize visual cues which could drive fish away from a fishing operation. In ancient times as well as sometimes today, fishing sinkers consisted of materials found ordinarily in the natural environment, such as stones, rocks, or bone. 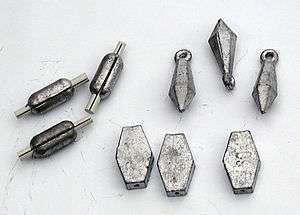 Later, lead became the material of choice for sinkers due to its low cost, ease of production and casting, chemical inertness (resistance to corrosion), and density. However, lead is known to cause lead poisoning and enter the environment as a result of the inevitable occasional loss of fishing sinkers during routine fishing. Thus, most lead-based fishing sinkers have been outlawed in the United Kingdom, Canada, and some states in the United States. Lead based fishing sinkers are banned in all of US and Canadian National Parks. These bans have motivated the use of various other materials in sinkers. Steel, brass, and bismuth sinkers have been marketed, but fishermen have not widely adopted them due to their lower density and higher cost compared to lead. Sandsinkers have also been developed, using sand as weight. However, sand has a comparably low density to that of lead and makes a poor replacement. Tungsten is now in use, especially among largemouth bass fishermen. Although several times costlier than lead, tungsten is just under twice as dense as lead and thus found desirable. The environmental effects of tungsten, however, are essentially unknown. ↑ Efforts to ban lead in fishing tackle Retrieved 8 April 2011. ↑ Kaminsky, Peter. "Picking the Right Sinker". Dummies.com. Retrieved 14 December 2010. 1 2 MPCA Home > Sustainability > Reduce Reuse Recycle > Nontoxic Tackle: Let's get the lead out! Archived April 20, 2010, at the Wayback Machine. ↑ Strigul, Nikolay, Agamemnon Koutsospyros, Per Arienti, Christos Christodoulatos, Dimitris Dermatas, and Washington Braida. 2005. Effects of tungsten on environmental systems. Chemosphere 61, no. 2 (October): 248-258. doi:10.1016/j.chemosphere.2005.01.083. ↑ Sinkersnaps Dissolving Sinkers. Retrieved 8 August 2013. Wikimedia Commons has media related to Fishing weights.